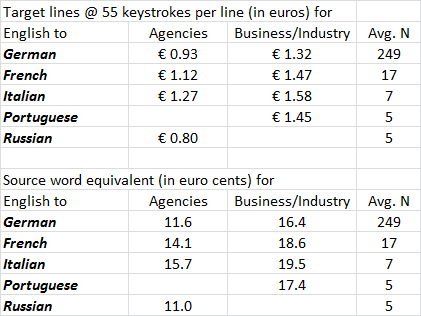 5 respondents for Russian, with the average rate of 11 eurocents per word... *sigh* I wonder which planet they came from. Average English-to-Russian rate is about 5 eurocents, and in fact many translators within Russia are happy with 2 eurocents. Hi Kevin, I'd love to subscribe to your site but can't use any of the options offered for subscribing to posts (including gmail and yahoo.) Is there any way I can subscribe using my csoftintl.com email address? Sophie, I'm not sure about the subscriptions, as I don't use such features myself. I used to through Google, but for some reason the feeds were always getting screwed up. I have thought about parallel e-mail distribution like Alex Eames appears to be doing now, but at the moment that's just an idle thought for which I haven't had time to develop the technical infrastructure. I'll ask around and see if I can find a better way. @D.: Some people say similar things about the reported BDÜ rates for German to English, which are, however, quite plausible. My own agency rates tend to be significantly higher (it helps to deal with agencies that attract a good clientele and can negotiate), whereas a few other categories are a bit higher than I typically charge. But the ten-centers all say "no way that can be true!" The five translators reporting for Russian are most likely qualified specialists in some way, court sworn or whatever. Many end clients and some agencies understand that a translator living in Germany can barely pay basic expenses at 11 cents per word, so the rates a translator in Smolensk might charge are irrelevant. In fact, I know two decent translators for Russian locally; one charges about this rate and the other charges more than I do. And gets it easily. But she's highly qualified and probably a damned good writer too, though my Russian is so lousy that I cannot judge that. "if I need a translation from German into Malay, I might have more options if I take the German > English > Malay route rather than go directly from German to Malay"
What do you think about the same. @ST: What do I think? That I don't quite understand your question, mostly. Google Translate is a lousy mediator. The "gateway language" technique is used by quite a number of professional organizations I respect for reasons that are clear and plausible. I don't think the actual characteristics of German or Malay, for example, are at issue. A good translator can bridge any of that. But how many good German-to-Malay translators are there in the world, and how much capacity do they have? What about English to Malay by comparison? It's mostly a matter of resource availability.